Happy Monday! I am ready for the start of a new week, aren’t you? Life is slowing down for us just a little after our family reunion. It always is sad to say good-bye to all the kids and grand kiddos, but, the experience of spending quality time with them is irreplaceable. I have been busy once again working around our home. I bought a dresser in May and was finally able to work on it recently. 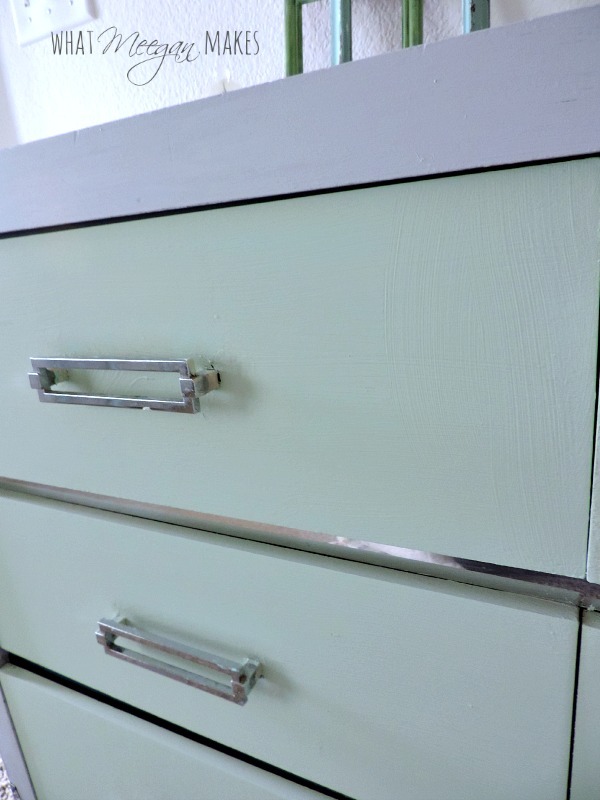 And, now I am pleased to share my Thrifted Dresser Makeover Using Homemade Chalky Paint. 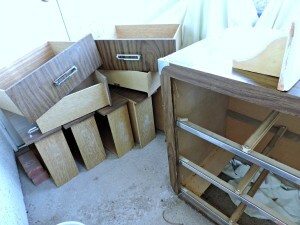 Hmm…I was hoping for a solid wood dresser and ended up with a laminate and press-wood finish. Not exactly what I was hoping for. And I had been searching something with a little more personality. I have looked and looked for a dresser for our bedroom closet for months. Yes, I said to put in our closet. At the time we had a Cal King bed, which took up much of our bedroom space. Since buying a new queen size bed, I chose to leave the dresser IN the bedroom. I decided to make the best of what I had for a terrific transformation, AND give it some personality of my own. 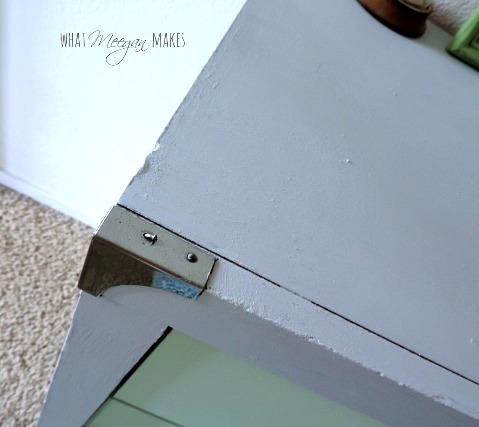 I made chalky paint using this recipe. It’s easy to make and always works well for me. The gray is called Antique Gray from Ace Hardware. The green is Summer Sonnet. I also used both of these colors when painting our bedroom. 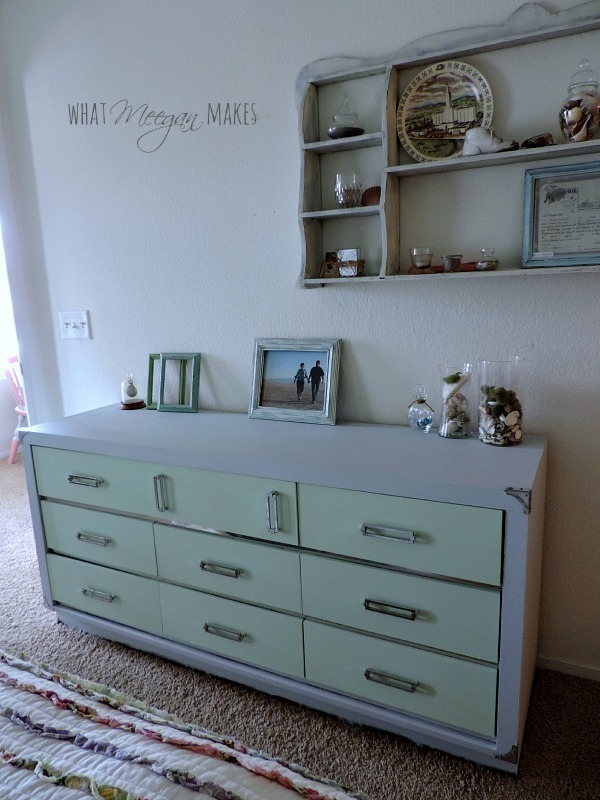 So it seemed logical to paint my thrifted dresser the same colors. Don’t you love the details on each corner? I thought about taking them off and adding new nails, but I like the old, worn look. The drawer handles look amazing after I scrubbed and cleaned them up. They look shiny and new now. 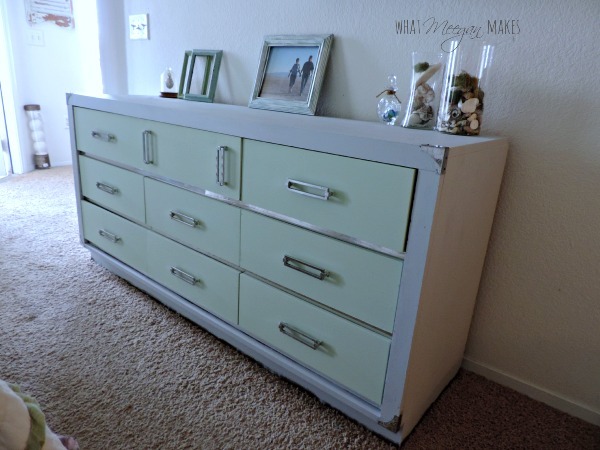 I am loving the silver detail in-between the drawers. Amazing what a little cleaning can do. 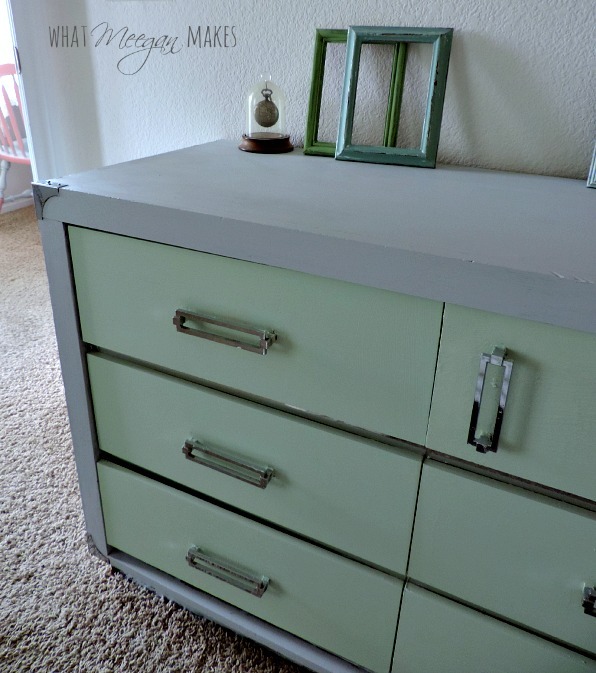 My Thrifted Dresser Makeover Using Homemade Chalky Paint looks perfect along side my new quilt, too. My next step for this dresser COULD be adding a stencil. Maybe, just maybe. It has to be the RIGHT stencil. And I haven’t found it just yet. I figure if it took me months to find a dresser, it might take me months to find a stencil (huge smile and a wink). 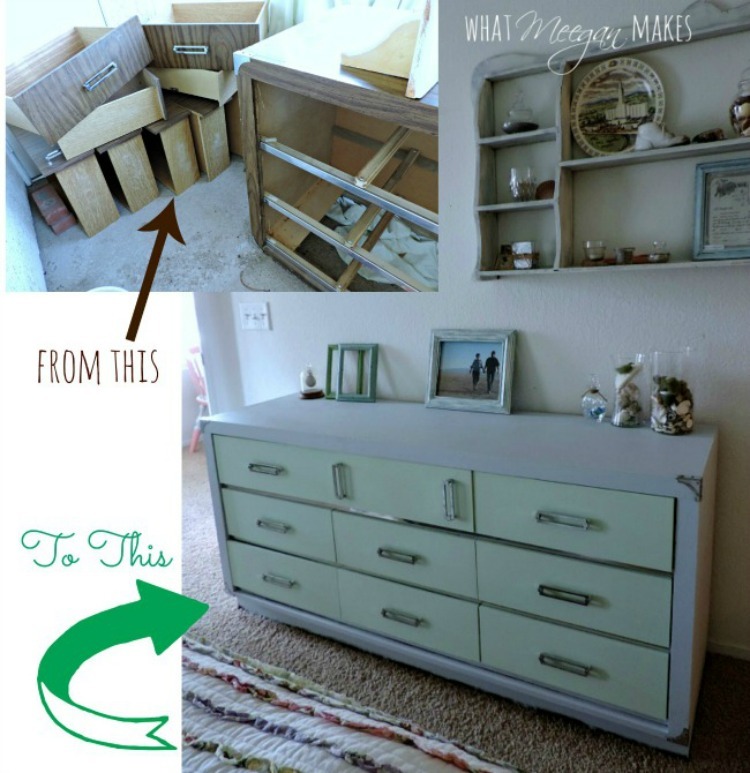 If you are out and about looking for THE right piece of furniture and you can’t seem to find it, remember you, TOO can transform it like I did with my Thrifted Dresser Makeover Using Homemade Chalky Paint. Thanks so much for stopping by today! I love having you here. It makes my day! That turned out AMAZING! I wouldn’t have thought it. You are so sweet Crystelle. Thanks for your kind words. What an AHHHHMAZING transformation!!! 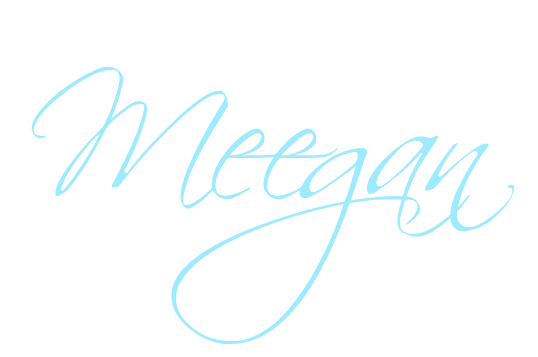 LOVE, LOVE, LOVE the color and all of that beautiful silver detailing! Thanks so much cute girl! Love love love your style, too. Love this piece to death! What a difference a fresh coat of paint made. And that hardware is to die for. Great job! Thanks so much Katherine! I am excited about your invitation. Loves! Oh wow! 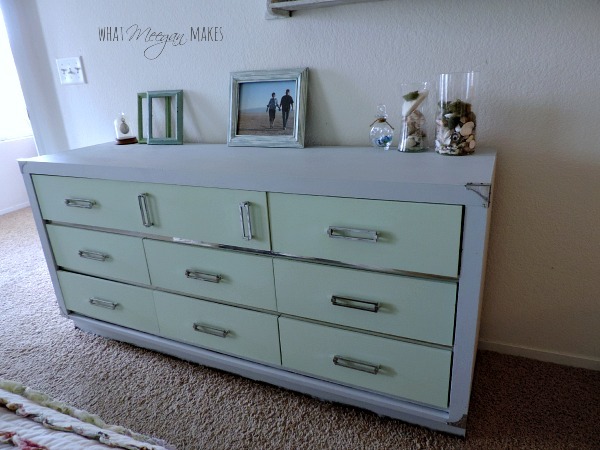 The dresser is gorgeous and I love the color you used! 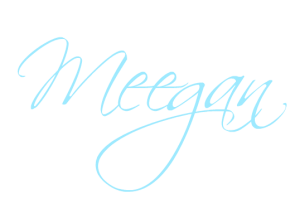 What a fab transformation Meegan! I love the corner pieces… they add so much! Beautiful job.